From the moment the first episode of Twin Peaks was aired in the Netherlands, I became hooked. As a consequence, I made it a mission to get all the music available. And there was some: the soundtrack album by Angelo Badalamenti, the album by Julee Cruise and even a vague Dutch production on a cassette. Unfortunately, the house scene also got their dirty little fingers on the theme of the series. 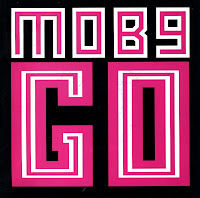 The most famous example is this, 'Go' by Moby. The single made number 10 in the UK and number 6 in the Netherlands. I first bought the cd-single while on a day out in the southwest of the Netherlands, but this cd-single only contained remixes that were rid of the Twin Peaks sample. So some time later, I bought the 7" vinyl single. It's still not the kind of 'music' that I like.